The UART on the Raspberry Pi uses the GND, TX and RX connections which are on the GPIO pins (see above). Plug the corresponding cables from a 3.3V UART cable onto these pins and then into a USB port on your machine. The card needs to have an msdos partition table with a smallish boot partition (formatted FAT32). The binary U-Boot file will sit there, called kernel.img, along with some other bootloader files. You can use the rest of the card for the root file system (but we’ll boot an initramfs, so it’s not needed). Next, mount the boot partition to /mnt, this is where we will copy everything to. Leave your SD card plugged in, we will need to copy the bootloader to it soon! There are default configs for both Raspberry Pi 2 and 3, so select the one you want. Now, copy the u-boot.bin file onto the SD card, and call it kernel.img (this is what the bootloader looks for). Sadly, the Raspberry Pi cannot boot entirely on open source software, we need to get the proprietary files from Broadcom and place them on the SD card also. Clone the Raspberry Pi Foundation’s GitHub repository. Copy the minimum set of required files to the SD card. Finally, unmount the SD card. OK, now our bootloader should be ready to go. Now we can remove the SD card from the computer and plug it into the powered off Raspberry Pi to see if our bootloader build was successful. Switch back to your terminal that’s running screen and then power up the Pi. Note that the device will try to netboot by default, so you’ll need to hit the enter key when you see a line that says the following. Of course, a kernel won’t be much good without some userspace. Let’s use Fedora’s static busybox package to build a simple initramfs that we can boot on the Raspberry Pi. If you want, you could modify the kernel config here, but it’s not necessary. Insert it into the Raspberry Pi and turn it on! Hopefully you’ll see it booting the kernel on your screen terminal window. That’s it! You’ve built your own Linux system for the Raspberry Pi! I followed the steps on raspberry pi 3. It booted uboot and tried to book kernel zImage..but hanged at Starting kernel…. Can you provide some of your configurations? Only problem is when I build a latest stable upstream kernel, I do not see more than 1 core, even though SMP is shown in the output of “uname -a”. I chose SMP in kernel features options in menuconfig. I find that you are creating a ram file system and booting from ram file system itself. How to boot using a root file system?. How do I compile a root file system and boot from it in raspberry pi? I tried to create a initramfs as per your custom-initramfs script. The file is created and I follow to unzip it and make a u-boot compatible image. I tried with -C gzip, and couple of other option like creating the .gx cpio, with compress, without compress and none of them are in correct format. What is the proper format for initramfs for RPi2/3? I am using y custom kernel 4.4.50 with initramfs enabled. Also all formats like gz, bz2 and others also enabled. U-boot loads fine and if I do not use initramfs in boot script I also can boot to my rootfs but with initramfs enabled in boot script it always drop to u-boot prompe and say that the Ramdisk Image is Wrong Format! I tried to compile and use 4.9-rc8 kernel and all was working! 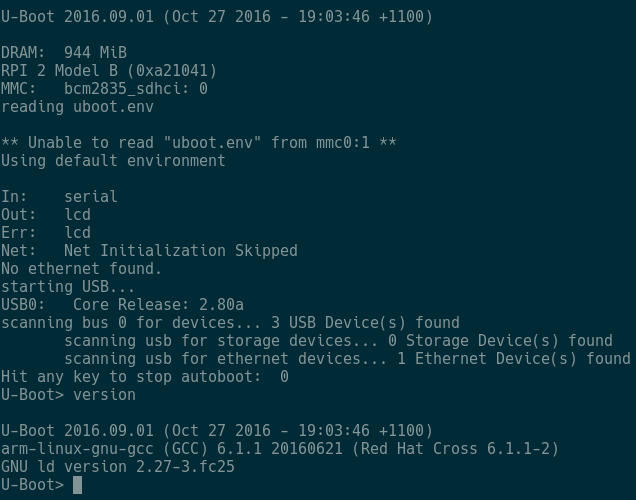 However, my u-boot compile (v2017) also was fine. My question is that, as 4.9 does not have compatible module and is not supported by RPi yet, I have to use to kernel, one with initramfs(zImage) and another for rootfs itself(kernel7.img). As this feature is part of the core Kernel, is there any patch to be able to use the 4.4.50 kernel forinstance for both initramfs and rootfs?! I am also very Ubuntu oriented. Is there any tools or script like what you have for Fedora based one to generate the initramfs based on Ubuntu? what is kernel_addr_r and fdt_addr_r? what values I should I use for those two, I am using raspberrypi 2 model b board. 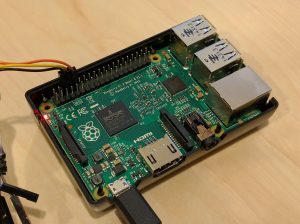 I built a linux successfully for rpi with the above mentioned steps. but I couldnt get the uboot messages on the serial terminal. Is there any aditional configuration for uboot to made be and built? You just use those, they are variables that should automatically be expanded in uboot. I think it should be a gzip compressed cpio. So it’s not unzip, it should be gunzip? The script to create the initramfs should also work on Ubuntu. Did you try it? What errors did you have? thanks a lot for this tutorial. I followed all the steps for the u-boot but when testing it in my Pi3 i see nothing on the console. I did it already twice. What can be the problem? ->I am using debian jessie system. Are you using the UART, or HDMI to see the console? Just a guess, but perhaps the binary firmware doesn’t know how to execute a 64bit kernel.img? Can you try to get it working with the 32bit version as per the post and make sure everything else is working, e.g. the firmware, u-boot and output on serial. Then try the 64bit one. I figured the solution to the problem. create_initramfs.sh not working on ubuntu. I have mentioned the logs below. BusyBox v1.22.1 (Ubuntu 1:1.22.0-15ubuntu1) multi-call binary. I’ve followed the instructions to compile the boot loader. This works, but if running the bootz command, u-boot complains that this command is unknown. Thanks, excellent description – works like a charm. In my case I was just building the ‘boats’ and had pre-built kernels an user-space images ready via tftp. OK thanks, I probably need to update the script. Hey Chris, have you realized that this kernel is initializing only 1 core? if you do a “cat /proc/cpuinfo” you will see that only cpu 0 is active. Looking into .config, I see that CONFIG_SMP is not set so I did a make menuconfig and added support for SMP (which sets CONFIG_SMP into .config. Still it doesnt bring up the rest of cores. DMESG –> RCU restricting CPUs from NR_CPUS=4 to nr_cpu_ids=1. Looking in init/main.c I see that the kernel tries to guess the number of cpus (but fails miserably) I am trying to investigate why we are only using 1 core (from the quad core) but your help would be great too. [ 0.198514] simple-framebuffer 3e669000.framebuffer: fb0: simplefb registered! [ 0.209778] RPC: Registered named UNIX socket transport module. [ 0.209788] RPC: Registered udp transport module. [ 0.209795] RPC: Registered tcp transport module. [ 0.209803] RPC: Registered tcp NFSv4.1 backchannel transport module. [ 0.348216] Installing knfsd (copyright (C) 1996 okir@monad.swb.de). [ 1.336744] oprofile: using timer interrupt. [ 2.263803] [drm] Supports vblank timestamp caching Rev 2 (21.10.2013). [ 2.270415] [drm] Driver supports precise vblank timestamp query. [ 2.422284] No soundcards found. 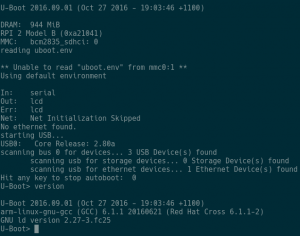 Hi Sved, I haven’t seen that… are you just booting using initramfs, or the root filesystem on the sd card? Hey Danny, yeah good catch. I haven’t looked into that much more, but if I get a chance I’ll take a look. Thx Chris for any help. The fstab url in custom initramfs script is showing 404 no found. Please check into that and provide an updated url. The kernel branch you suggest does not have the RPi 3 device trees, so I go to the latest stable (which does), build and install as per directions, but it always hangs at “Starting kernel”. Here are some of the commands I am using. Any ideas for the Pi 3? Should I just pretend it's a 2? Just to go a bit further – using the suggested kernel from 4.9 revision with the 2-b device tree gets me to the arm login, but I can’t type anything at that point. I can type at the u-boot prompt (interrupt it and run things), but the busybox prompt doesn’t respond to my keyboard. Is that usb keyboard or over serial? Might be missing usb-hid drivers in the kernel? Or maybe some issue in device tree intialising USB devices? Do you see any kernel messages when you unplug and replug the device in?